Happy fourth birthday, Big Dummy! How time flies, the best bike in the world is four today! And on this special day comes the obligatory gear/accessory updates, recap of the past year of mamabike-related exploits, and a summary of our deeds of the day. Ch-ch-ch-changes: After three years of procrastination, I finally got the Xtracycle Hooptie! And will post about it at some point. But the bigger news (well, more unique news) is my new two-bike tow hitch! No more bag-and-drag!! Bag-and-drag is AWESOME, for the record, but 20 inch and bigger wheels take up all the cargo space. It’s gotten hard to carry two kids, two bikes, and still squeeze in our other stuff (snacks, toys, bike event craft supplies, impromptu groceries). Made by Haulin’ Colin at Cyclefab (p.s. 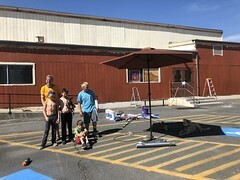 nine days until A Very Open House at Equinox Studios Creative Industrial Complex where Cyclefab resides–you should go! ), it’s a custom job, but I’m sure he’d make more. So why the hitch? While the kids (8 and 6 now) are riding their own bikes more and more, I always ride the mamabike in case of exhaustion or tantrum so I’m towing as much as always. Also, the kids have recently each moved up a bike size (20″ and 24″ Islabikes) which means they both have quick-release front wheels now! And if I put a wheel of 20 inches or bigger in my right pocket, it often pinches my rear derailleur cable. This isn’t an extremely big deal since I have a triple on the front and can make do with the range it provides, but I prefer to access to all my many gears. And now that the kids are both sitting on the deck, a wheel 24 inches or bigger means the rear kid needs to sit side saddle (see the bag-and-drag picture) which isn’t horrible, but also isn’t ideal. Now if they both sit side saddle, it’s noticeable and takes more muscle on my part to manage…although I joke it’s the only core strengthening I get. Camping! There was a lot of camping! I don’t consider myself a practiced bike camper (or any kind of camper), but whereas in past years we went once each summer, and only for one night, this spring and summer we went a bunch of times and twice for multiple nights! We took the Clipper to Canada again for Spring Break Victoria, BC multi-day bike camping! However, our friends brought our gear to the campsite and back so this should be considered “supported bike camping”. 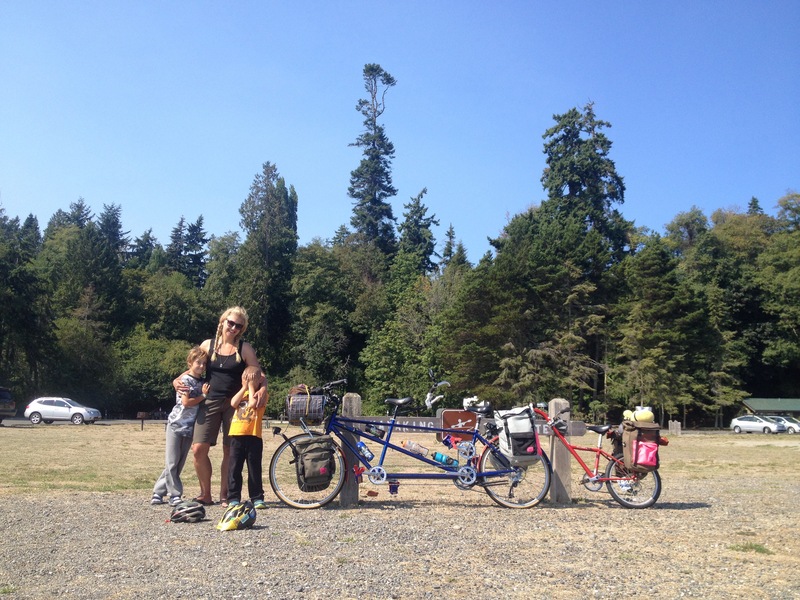 We also led a family bike camping trip for Swift Campout (photos on Flickr here) that had 65 people and 2 dogs! And the kids did an S24O (sub-24-hour-overnight) when I fetched them from swim camp at 3pm and whisked them away to Fay Bainbridge, only to wake them up at 5:30am to deposit them back at swim camp by 9:00! However that involved me riding to and from Fay Bainbridge Park twice (the hell I was gonna pack up camp by 5:30am! I’m like the slowest tent un-pitcher in the world). And that was the day I realized that while Fay Bainbridge is relatively close for bike camping, it’s farther than I want to bike to twice in one day. I don’t think I can claim S24O for myself due to my extra time spent away from home versus the kids’ time spent away from camp. Kidical Mass family bike rides are still going strong in Seattle. We led a ride on the same day as all the other Kidical Masses for Kidical MASSive…and ours had 221 participants! Today’s biking started after I walked the kids two blocks to school. I recently started hosting a weekly #coffeeoutside called #coffeeoutsideforher (but everyone is welcome, not just women). Currently, we meet every Thursday at 10am in the Gas Works Park picnic shelter. I post a reminder to my Instagram each Wednesday. It was drizzly at the time, but earlier rain meant there were some fun puddles. Uh, note that I always caution the kids not to ride through puddles because you never know what might be lurking in them…like a pothole that could toss you over your handlebars. Although last time I tried this argument my six-year old said, “But Mama, I’m a pro.” I can’t argue with that. Next up I realized shortly before the kids were done with school that I wanted a Square credit card reader for my iPhone and I wanted it now. I opted to take the Straggler instead of the Big Dummy, which goes against the rules of The Big Dummy’s Birthday, and that must be the reason I confused the two mail stores and went uphill the wrong direction to the UPS Store and had to turn around and head to the closer and woulda-been-flatter FedEx Store. I think had I been on the 80-pound Big Dummy rather than the 35-pound Straggler, I would have thought things through and not mistaken one store for the other. Hills, man. Finally, we had planned to attend the Seattle Neighborhood Greenways #Party4OurStreets 5:30-7:30 p.m., but things seemed to conspire against us. We set out early, kids reluctantly on the mamabike rather than their own bikes because I don’t want them riding through downtown to Pioneer Square, especially in the dark and rain. 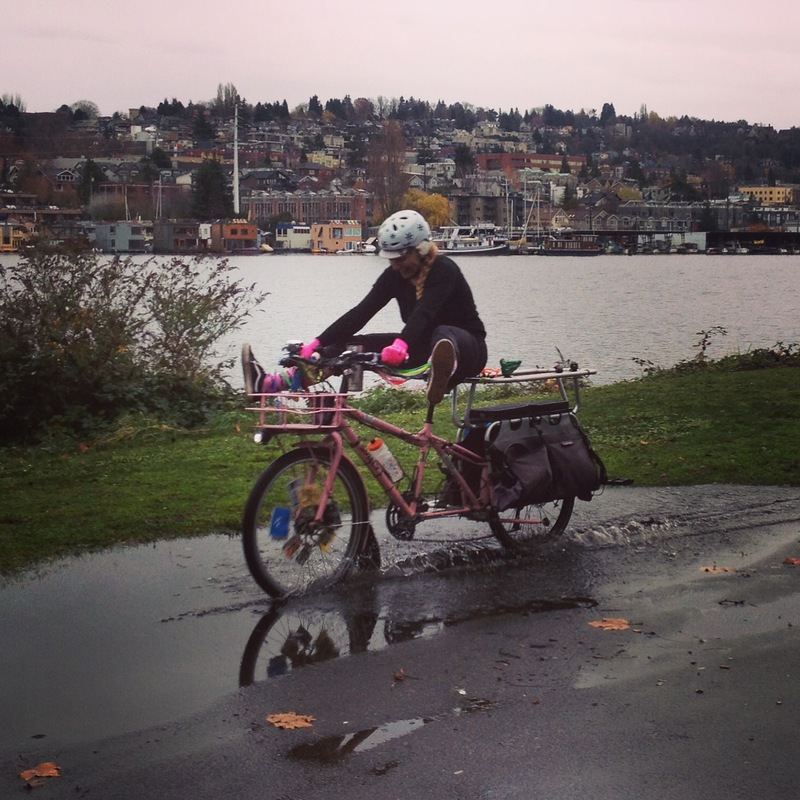 It was dry and not very cold when we headed out so our rain gear was stowed in a bag and we only planned to ride to South Lake Union for a very early dinner before the event. But then we got a phone call and had to head home to quickly help a friend. On the way back the rain started up, but the kids didn’t want to stop and don rain gear. It’s hard to get back into the swing of cold and rain after summer and we’re still getting back into the groove of layering up out the door and stopping to add rain gear as soon as rain starts. 10 minutes from the venue (and still on time at this point! ), my six-year old finally admitted he was cold so I pulled over to help him put on his balaclava, rain pants, and shoe covers. My eight-year old was shivering, but just wanted to push on. I figured we’d all dry out over the two hours so I didn’t force the issue. A block later we came to the first block of the 2nd Avenue protected bike lane…or rather the construction tunnel taking the place of the first block of the 2nd Avenue protected bike lane that none of my friends will ride through. I have only taken the lane in the safety of group rides and otherwise slowly navigate the tunnel. Today I had my Xtracycle WideLoader on because I was carrying a box of books to sell at the party (oh hey, Urban Cycling: How to Get to Work, Save Money, and Use Your Bike for City Living is out now!) which caught on the one tunnel post that protrudes into the bike lane. And we tipped over. By the way, this has happened once before–coming home from bike camping a year or two ago when I caught it on a car parked sticking a foot into the Dexter bike lane. I think I don’t ride with it often enough to clear unexpected obstructions. Though I’ve had a hundred successful rides with it, on many of which I avoid certain favorite routes due to very narrow spots. So bummer! Sorry kids! They were unscathed, of course, but were unhappy. And freezing. Had they not been freezing, I think they would have wanted to still go to the party, but I took one look at their little faces and said we could go home if they wanted. And they wanted. We stopped in Westlake Park to get a hot dog for the six-year old, but the eight-year old just wanted to go straight home to a hot shower. Not too surprisingly, we all had fun on the ride home. An Uber driver rolled down his window to laugh and say hi as he saw me holding the hot dog out for my six-year old to take his “red light, hot dog bite!”…and then zoomed forward as the light turned green so he could pass us from the right-turn-only lane on our right and continue straight into the bus-only lane before merging to the left. Grrr. We admired the parked boats by MOHAI as we biked through South Lake Union Park…and had to dodge a Vespa on the path. That can’t be legal! Grrr. As you can tell, I’m a tad grumpy after the crash. Of course there was the obligatory brother-on-brother pummeling when they couldn’t agree on the lyrics to the “red light, hot dog bite!” song, but stopping to watch a barge go through the open Fremont Bridge helped distract them. I look forward to reading details of the party. I heard I won something! Of course we’re all winners when we choose to ride bikes…we’re just more winning when we keep the rubber side down. 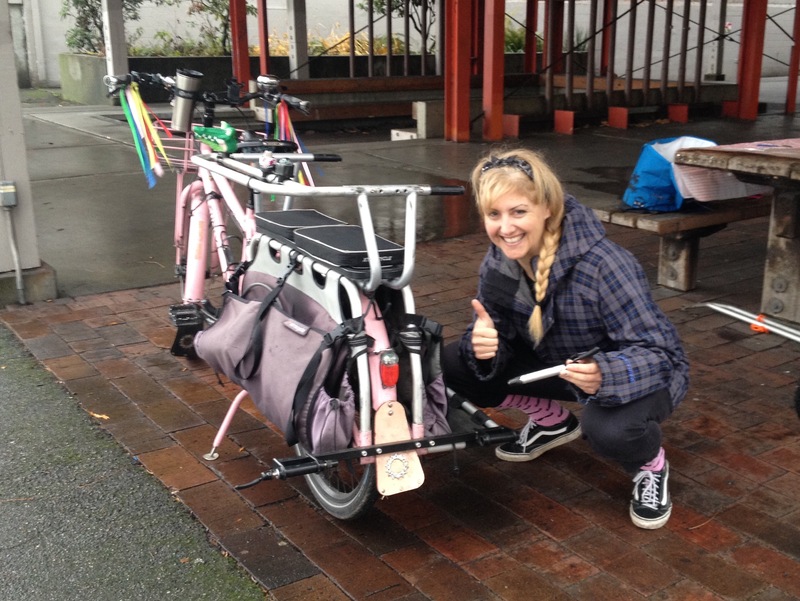 In reviewing last year’s birthday post, I see I spent a lot of time talking about my then-new Surly Straggler (who also just had a birthday, but it didn’t get celebrated because that only happens for the amazing Big Dummy! But still totally loving the Straggler.) This year we got a new bike, too, which I fully intend to post about at some point. It’s a previously-owned, locally-made Rodriguez tandem to which I hook a Burley Piccolo trailer bike. It’s awesome! Two of our camping trips were taken with it. 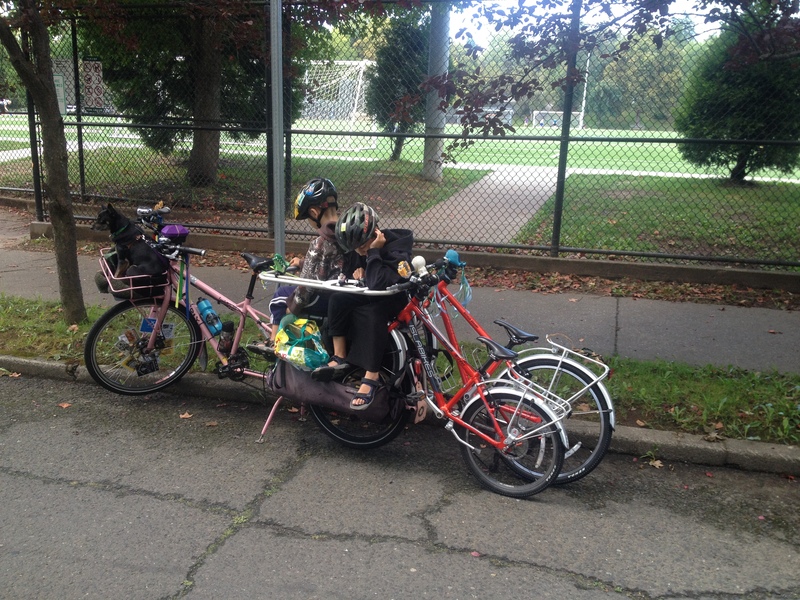 The kids don’t do a lot pedaling yet–which I knew would be the case because we see other kids on tandems–but overall the bike weighs about ten pounds less than the Big Dummy so it’s more pleasant to take hilly bike camping. I think we’ll gradually use it more and more because I can’t imagine the kids riding their own bikes many places in this city still, but rest assured the Big Dummy will never leave our fleet. I also see that a year ago labeled myself “car free” with the car title still in my name for “a little while longer”. LOL, that “little while longer” finally came a few days ago so now I am car free. For real this time. The last time I used my former car was when I borrowed it two summers ago for Portland Fiets of Parenthood. I can’t remember the time I used it before that. So the Big Dummy is even more my One Less Minivan now. As a family, I feel that we’re less car free than before which weighs on me. To explain: the car left with the-former-Mr.-Family-Ride 16 months ago. So while I enjoy the freedom that comes with never having to think about a car, the kids now spend every other weekend in a car. I feel a bit inauthentic when I think about being car free. Like the much bigger adjustments this change to our family entails, I think it will just take time to get used to the new normal and maybe at some point I’ll feel comfortable using the term “car free”. But either way, I’m ecstatic not to need to deal with a car now. 1) The kids? They’re totally fine! Phew. 2) Me? I’m “profoundly sad”. I’m not sure if that was a diagnosis or an observation, but it fits. UNLESS I’m riding bikes, that is. Or talking to people about bikes. Or thinking up group bike rides. Or writing about bikes. So basically, way more often than not I’m perfectly fine. Because bikes are magic and make even profoundly sad people happy. And I’ll eventually be fine 100% of the time, of course. Also, while I find it difficult to be without the kids every other weekend, that does mean 100 less pounds on my bike every other weekend so I can ride a lot farther. 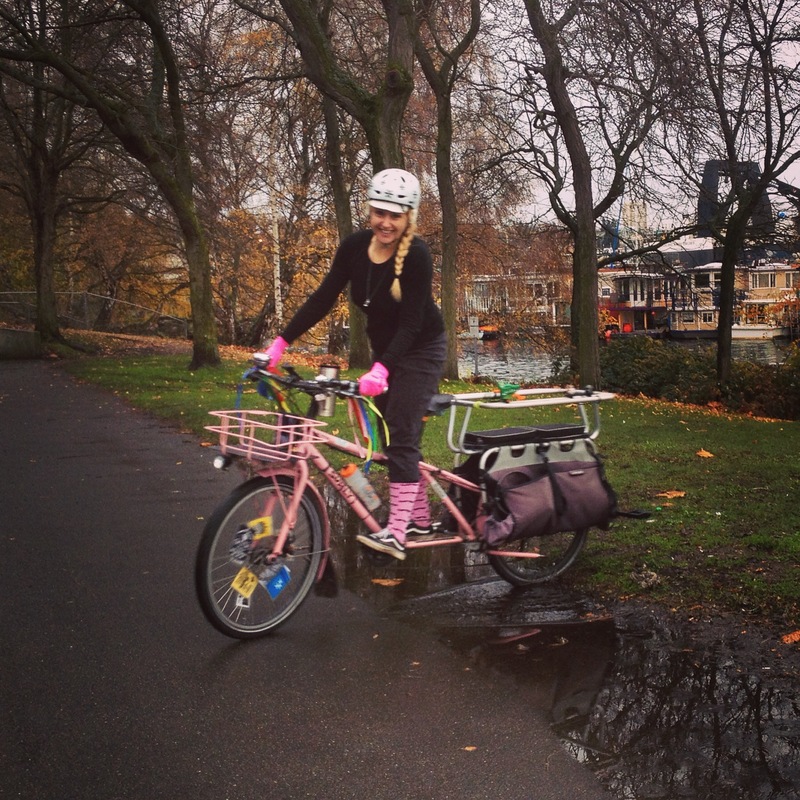 And ohmigosh it’s really easy to travel as just one person with one regular bike! I’ve taken the train to Portland and Vancouver to hang out with family biker friends. It takes like (like!) five minutes to pack and I don’t need to go to three different grocery stores to get the appropriate train and travel snacks. So there’s that! 3) If you have any other questions, I don’t know that I can answer them, but contact me anyway! Advice always welcome. Love the post, as usual. In my opinion, you can definitely and very non-apologetically call yourself car free! I’m sorry to hear that you are going through some tough times. I am super interested in your towing rig, and would love to see some pics of it in action! M will definitely be moving to a 20 or 24 inch this spring (oh golly did he look giant in his 16″ on the way to school yesterday)! Btw, haven’t seen you since I was preggers – we have a wonderful 4 month old now, and I am certain that her enthusiastic leg kicks are mimicking pedaling. Thanks for all you do for the family biking world. CONGRATS!!! Of course as I was typing “Vancouver” I felt a strong urge to come visit. I’ll have to be up again soon. I will do a post with more pictures of the hitch in action soon. I can so relate to what you say here about all things biking bringing you happiness when other things are getting you down. Thanks for bringing me some bikey goodness when I needed it! You are awesome! Thank you :) I’m gonna come find you one day next week, you are warned.